A list of free and paid courses, diploma courses, certification courses, short video courses, and more! 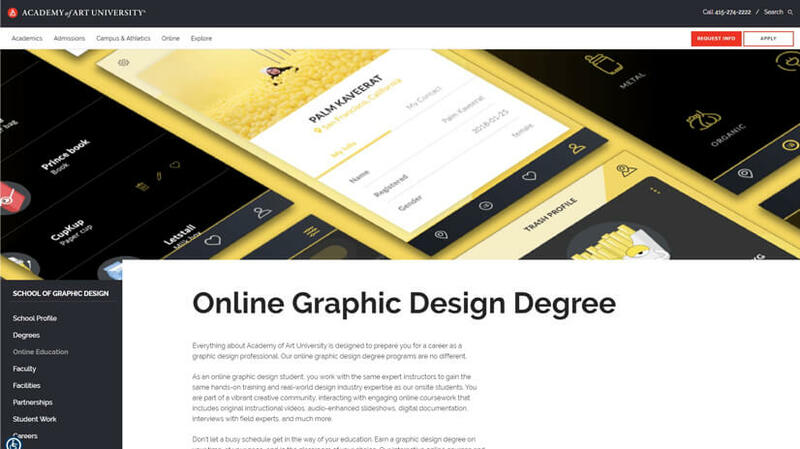 Looking for online graphic design courses? This post is for you. Read on! In the era of unlimited information available online, the opportunity for people to follow their dream career no matter of their location in the world is just more accessible than ever. If your dream is to become a graphic designer and/or master your skills in this professional field without being restricted by physical boundaries, then you’ve landed just on the right place. In this rich selection of online graphic design courses, you will find free and paid options, diploma courses and certification courses, short video courses and even more options for online graphic design courses that will give you the knowledge needed to kick-start your career as a graphic designer. Let’s begin! 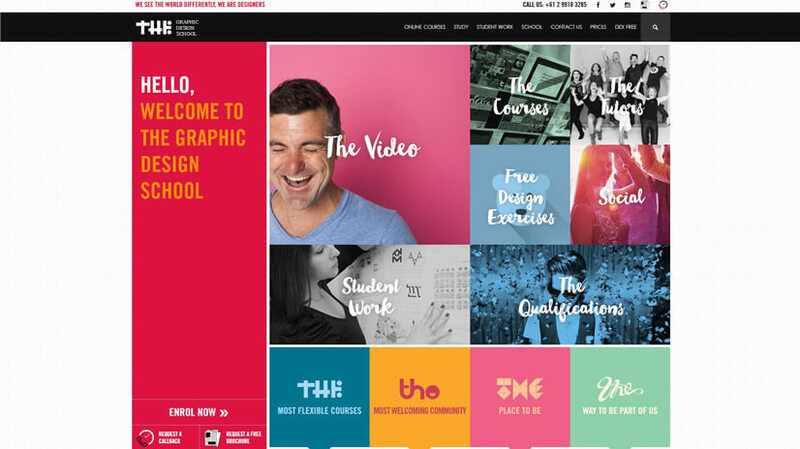 Established in 2008, The Graphic Design School is the first of its kind that offers solely online education in the field of graphic design. The school’s courses are with flexible schedules and pathways which means students can take them from any location. The educators are designers themselves and fully ready to share their experience and guidance through a cognitive approach. They will also introduce you to the idea of keeping a visual journal which can play the role of a portfolio at a later stage. Users of all levels can enroll in these courses gaining access not only to the course itself but to their own student website – the Schoolyard. In this site, students can access an e-library, training videos, and a forum. Even if you opt for the Intensive Foundation Course, you can upgrade to Certificate IV later. The upgrade includes a 12th module and 5 more assessments (a total of 20-50 hours more). Situated in San Francisco, the Academy of Art University has been offering online education for over 16 years. The innovative approach of this university provides students with a unique online learning experience thanks to an array of online tools specifically developed for the needs of their students. Such a tool is their custom-designed Learning Management System which allows you to upload your work and share it with your class and instructors. The online education at Academy of Art University provides a great collaborative space where students can chat, make relations, exchange experience, give and receive feedback and more. The Online Graphic Design Degree program provides all the necessary materials for you to study: videos, slideshows, documents, interviews, live streams. And you can study at your own pace. Information about admission, curriculum, pricing, and financial aid is available upon request. IACT is a certified training center based in Ireland. The academy offers certified individual courses and diploma courses recognized internationally. 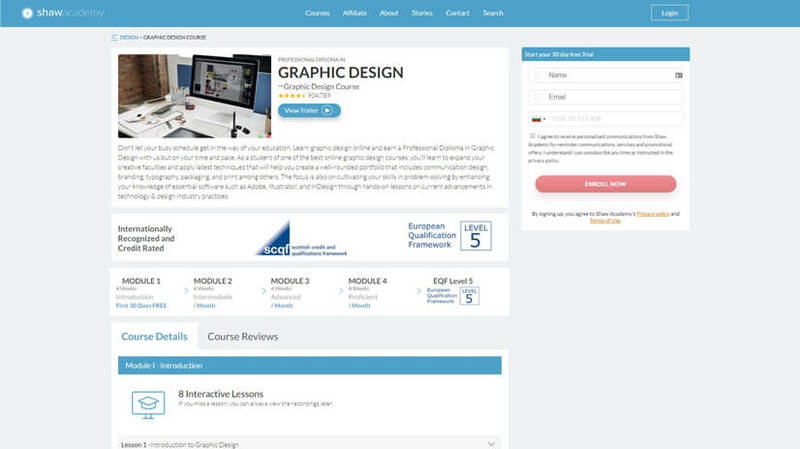 Among the various computer studies provided by IACT, you will find graphic design courses and graphic design master diploma course which can be taken fully online. No prior knowledge of Adobe products is necessary – the courses are suitable for users of all levels. At the end of each course, you receive accredited CPD Certification. Paid subscription for all courses is available (excluding Diploma courses). Animation and video output for social media and digital designs. Design principles of layout design. Creating maps, plans, and point of sale signage. Internationally recognized accreditation. You receive an IACT Master Certification. 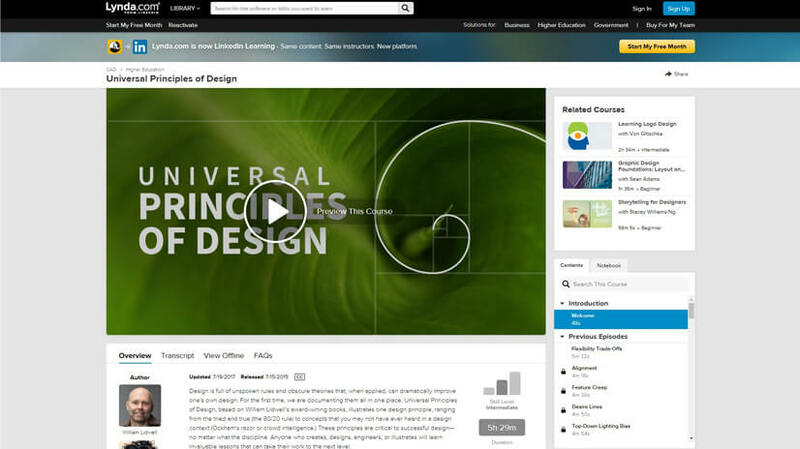 Coursera is one of the most popular platforms providing MOOCs by reputable universities and colleges from across the globe. Regarding graphic design, the platform offers a great specialization by The California Institute of the Arts consisting of several courses on key graphic design topics. The provider of this specialization – The California Institute of the Arts is also known as CalArts and is a top college in the United States. The educational institution is among the leading ones in the field of visual and performing arts. 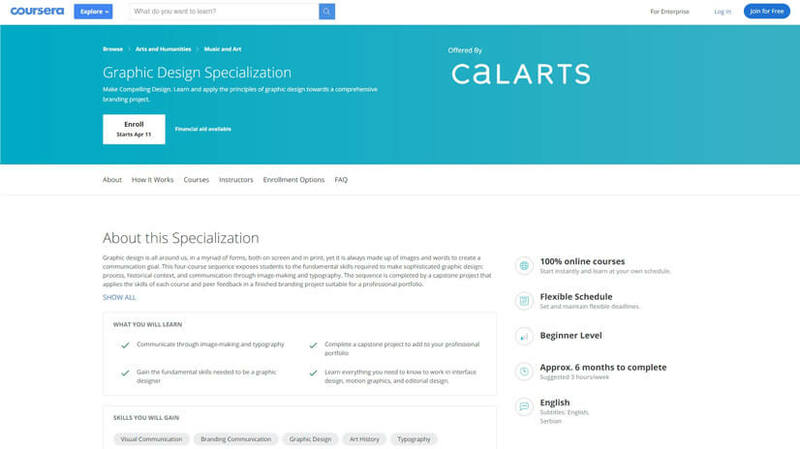 Here are a few details about the graphic design specialization CalArts provides on the Coursera platform. Includes 5 courses. Each can be taken separately. Free audit access to all 5 courses – you can read and view all content for free. Approximate completion time of all 5 courses: 6 months (3 hrs/week). The course is self-paced. You can pause the course whenever you like. Basic knowledge of Adobe In Design, Illustrator, and Photoshop is needed in order to complete assignments. To earn a certificate, you will have to finish all 5 courses and complete a hands-on project based on a real-life challenge. Use of scale, weight, direction, texture, and space in a composition. Designing a full-scale typographic poster. Making of image-based design choices. Shaw Academy is an educational company providing fully online and accredited courses in different fields. The mission of the Academy is to provide personalized and interactive education while delivering engaging, relevant and up-to-date content. In the field of graphic design, Shaw Academy offers a Professional Diploma course with EQF accreditation and global recognition. This means that at the end of this course and upon finishing all course assignments successfully, you receive an EQF Level 5 Professional Certification. Shaw Academy offers a paid membership which gives you access to all courses, although it is recommended to take one course at a time. At a pace of 2 lessons per week, you should finish your course for about 4 months. [/column] Udemy is one of the most famous platforms for online learning that offers courses on a wide range of topics. The education platform has acquired a system based on ratings and reviews to help users choose the best courses for their needs. The courses themselves are prepared by independent educators and priced individually depending on their topic, length, and of course – the rating of the lecturer himself/herself. 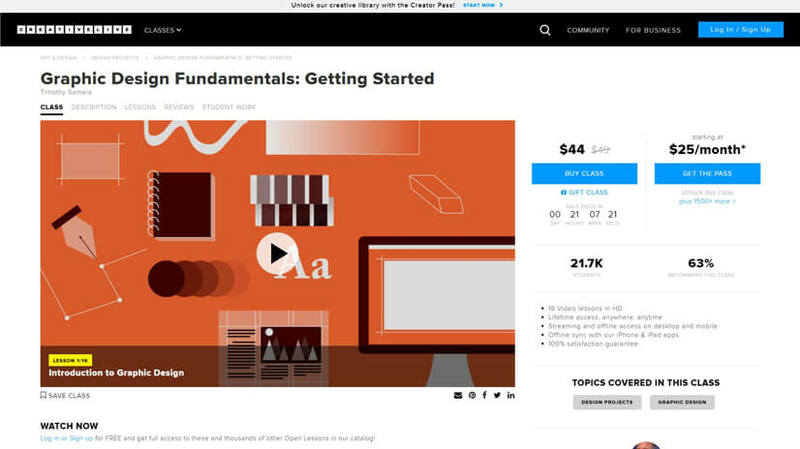 Udemy offers many courses in the graphic design field, most of which are quite affordable. Moreover, Udemy often offers promo codes for significant discounts and sales that save you up to 90% of the course price. 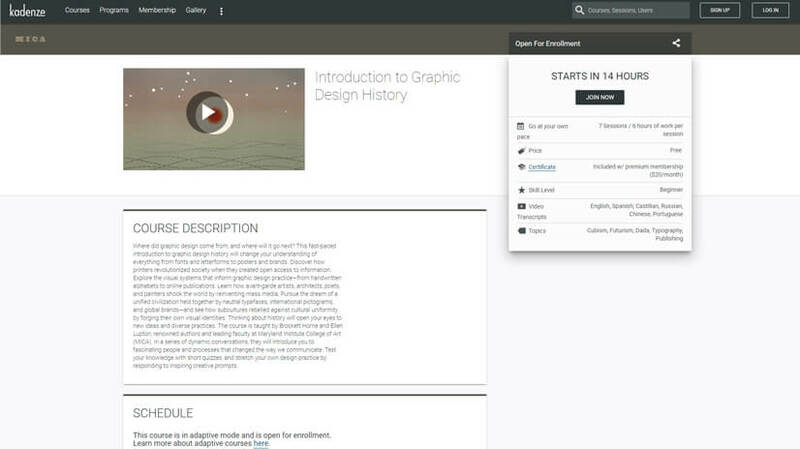 The variety of graphic design courses on Udemy is big: there are courses on broader and narrower subjects. Here are several picks that will help you get started in graphic design even if you have no previous experience. 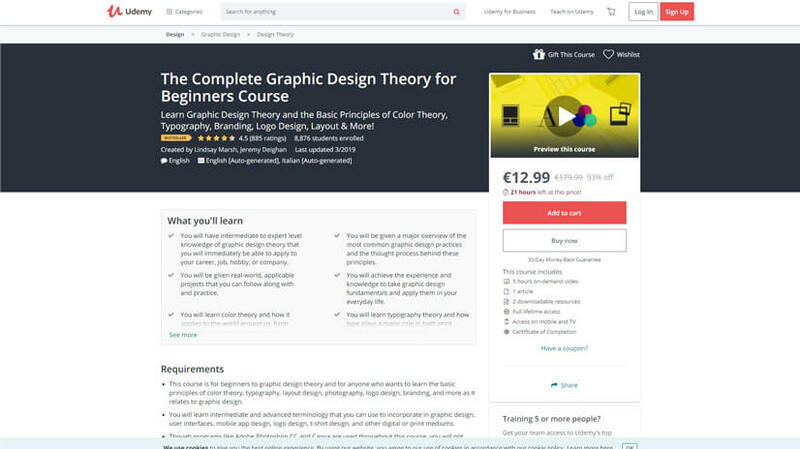 This theory course is aimed to give you an intermediate to an expert level of understanding the graphic design theory and processes. If you decide to follow along with the video lectures, you will need to have access to Adobe Photoshop CC and Canva. Even if you don’t, you will still find the course useful, as it is focused on the fundamentals of graphic design. A project-based learning course that will give you the practical knowledge, skills, and some hack (like program shortcuts) needed to create some of the most important graphic design work such as custom logos, business cards, brochures, web graphics and more. The course requires that you have access to Adobe Photoshop, InDesign, and Illustrator. However, previous experience in graphic design field is not required. Once enrolled, you also get access to a private Facebook group where you and fellow learners can exchange feedback and experience. When you purchase this course, you receive lifetime access to all lectures included, as well as access to 10 downloadable files which you can use for educational purposes. 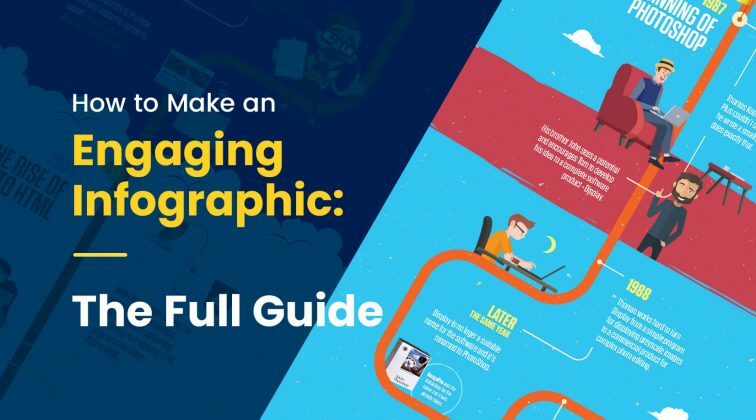 By the end of this course, you will be able to create an entire brand package covering the design of all marketing materials that go with it. 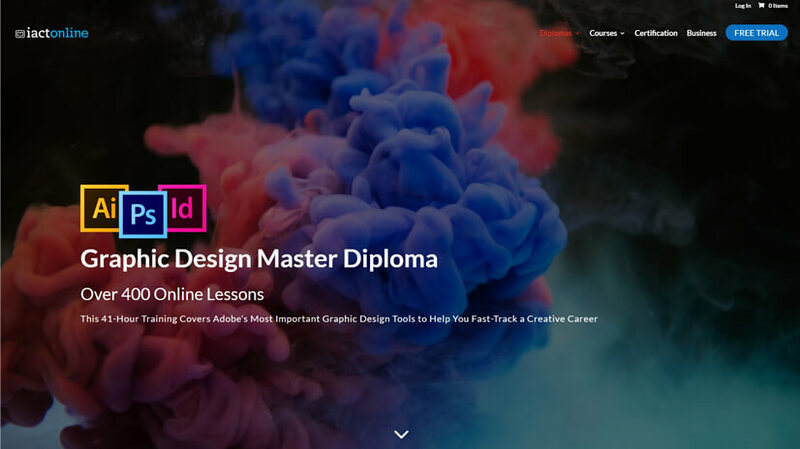 The course is updated frequently with fresh lessons and projects, so it keeps up to date with the fast-paced change of graphic design trends and modern techniques. By enrolling, you get lifetime access to the lessons and access to 6 downloadable resources. A course dedicated to design principles and concepts suitable for everyone who is building a career in graphic design. 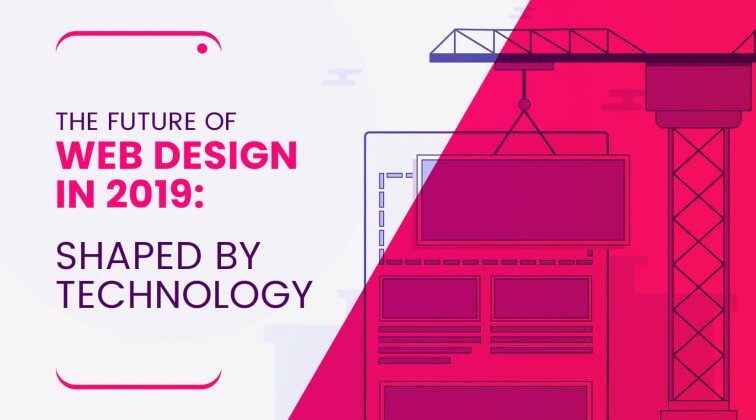 This course covers interesting insight and crucial rules about design which every graphic designer have to know and apply. The course is ever evolving with new tutorials and lessons. This means you won’t receive certification for completing it but instead, timely and regularly updated information about tricks and techniques in the graphic design field. A short course defining the importance of brand strategy from a designer’s perspective. From this course, you will learn how to create a brand design identity in the long term. The course will help you understand the importance of the core factors of a brand (purpose, mission, target audience, position on the market, etc.) 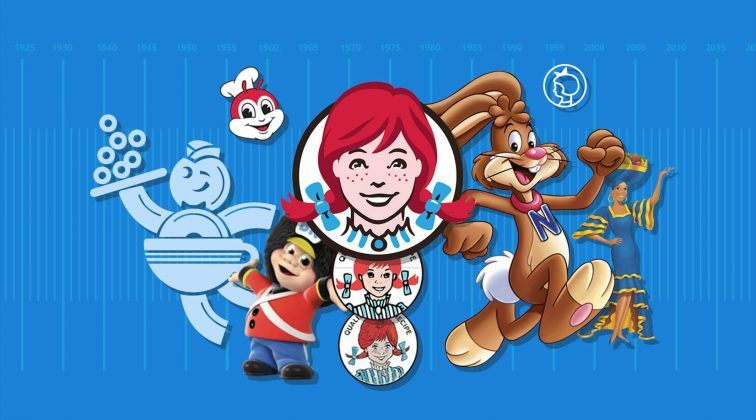 and their influence in creating the brand design. Kadenze is an online learning platform which partners with leading global educational institutions in order to provide quality courses in the art and creative technology fields. There are a lot of courses on Kadenze which are free for enrollment and view-only access: you can watch the lectures and read the discussing but you can’t participate. If you become a premium member, you will be given full access to all functionalities of the platform, as well as exclusive lessons included in the course. As a premium member, you are also entitled to certification for each completed course. Moreover, on Kadenze courses are either scheduled which means you have to follow a strict schedule once enrolled, and adaptive which basically means they are self-paced. An exclusive course which is a part of The Complete Typographer learning program. The course focuses on the role of typefaces, as well as how to choose the right typeface and mix different typefaces for a design project. As a part of The Complete Typographer program by School of Visual Arts, the course is currently available upon purchase of the whole program and suitable for intermediate users. Creative Live is a learning platform providing online classes in creative fields like art and design, photo and video, music, crafts, and more. The educational platform works with over 650 instructors from all over the world providing classes in their specific fields of expertise. Regarding graphic design, you will find classes on narrower or broader topics, topics covering the design essentials (color, typography, lettering, etc. ), the different fields of visual design (graphic, logo, UX, web, etc. ), and even classes devoted to specific software (Illustrator, InDesign, Photoshop). Are You a Type Criminal? 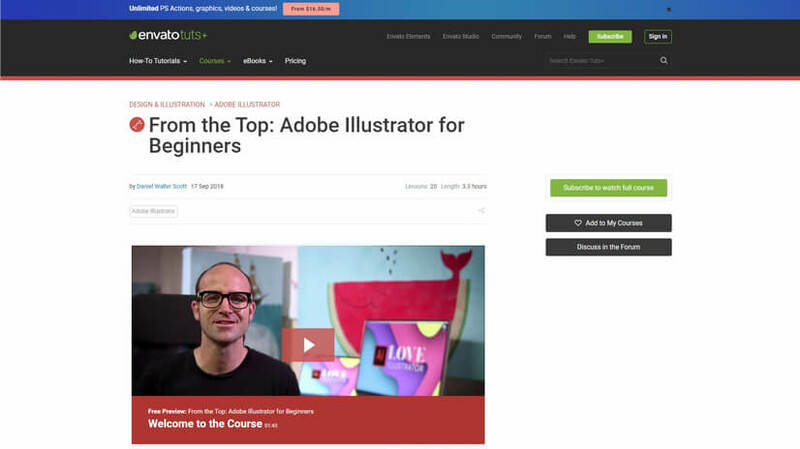 On the learning platform Envato Tuts, you will find over 1200 video courses on all kinds of subjects in the fields of graphic design and illustration, web design, code, photo and video, and more. All courses allow you to learn at your own pace and follow your own learning path. The video courses are focused on practical learning and are organized into chapters. You can gain access to all video courses by subscribing for $ 16.50/month. A subscription to Envato Tuts+ actually gives you access to Envato Elements, as well. Skillshare is an online learning platform whose classes are not only focused on giving information but also on doing. 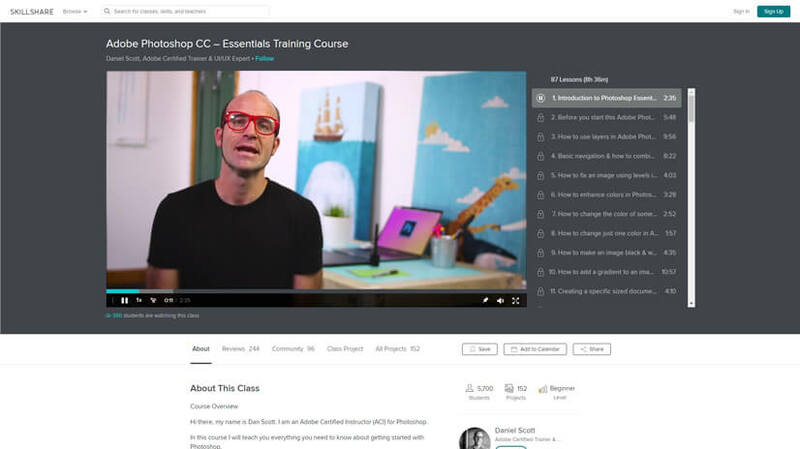 Each class on Skillshare has a practical project that lets you instantly apply the skills you just learned. Moreover, you can collaborate and communicate with Skillshare community. 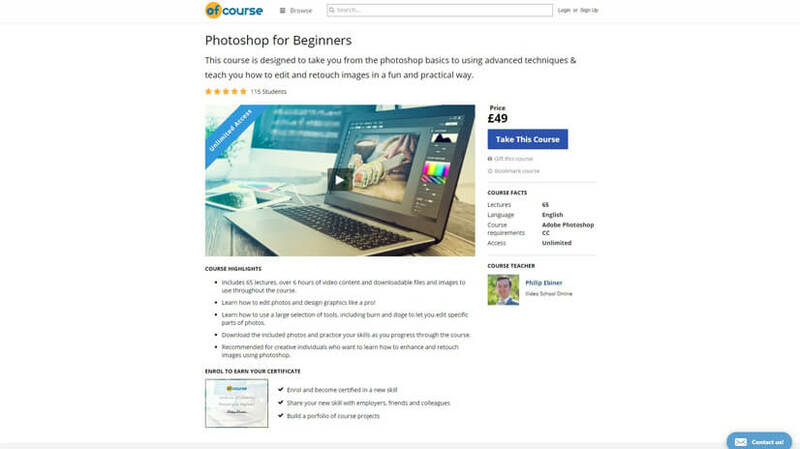 A highly popular beginners Photoshop course led by an Adobe Certified Instructor (ACI). This course includes 87 videos covering all kinds of tools and tricks that will turn you from a beginner into a master of creating compositions with Adobe Photoshop. You will acquire great masking skills, learn how to make interactive type, how to retouch photographs, how to distort, transform and manipulate images, how to create amazing graphics from scratch, and many more skills. 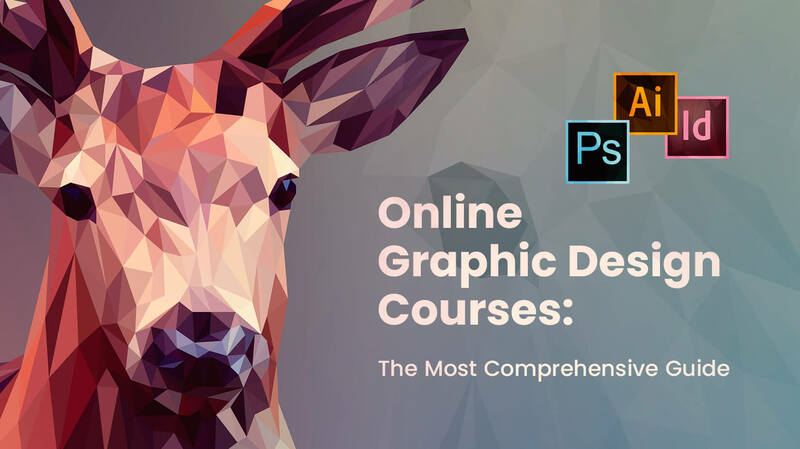 A course suitable for intermediate users in graphic design. This class will teach you the full graphic design course you should follow when creating a brand identity for a company. Consisting of 45 videos in total, this course covers skills like creating a logo, creating package design, stationery design, ad design, T-shirt design. You will also learn Adobe Xd from the basics – how to create a web layout and working wireframe in the software, and many more skills. Of course is an online marketplace providing video courses led by accredited experts in different professional fields. The platform offers over 1000 courses on various topics subjects – perfect for beginners, as well as intermediate users who want to master their skills. After finishing each course, you get a Certificate for completion. Let’s see a couple of courses in the graphic design area. Alison is an online learning platform providing completely free courses available for everyone to enroll and complete. A course is considered completed once you achieve a result of at least 80% of all course assessments. 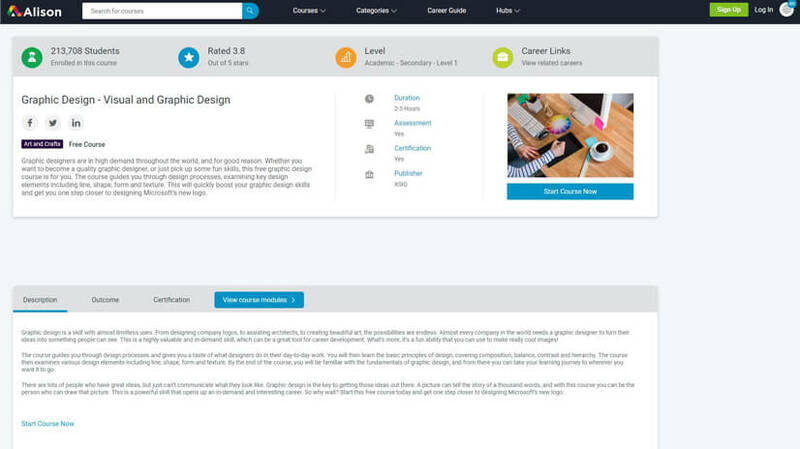 On Alison, you can enroll in courses in various fields including graphic design. If you’d like to receive a Certificate, there are 3 options available for purchase: digital, print, and framed. A free theoretic course in graphic design which introduces the fundamental graphic design elements (line, shape, form, texture), as well as graphic design principles (composition, balance, contrast, hierarchy). Perfectly suitable for beginners and a good start for everyone who is just starting their career in graphic design. There are plenty of opportunities out there for graphic design enthusiast who want to level up their skills in this highly demanded professional field. If you’ve made it till the end, you deserve our congratulations. We definitely believe you’ve got all it takes to make it into the competitive world of graphic design! If you’d like to share your thoughts or recommend another online graphic design course you’ve taken, feel welcome to use the Comments section below. 6 Trends for the Classrooms of the Future: What Will Change?